OpenXCAP is an Open Source fully featured XCAP server. An XCAP server is used by SIP SIMPLE clients and servers to manage buddy lists and policy for subscriptions to presence or other type of events published using the SIP protocol. OpenXCAP is licensed according to the GPL version 2. The XCAP protocol allows a client to read, write, and modify application configuration data stored in XML format on a server. XCAP maps XML document sub-trees and element attributes to HTTP URIs, so that these components can be directly accessed by clients using HTTP protocol. 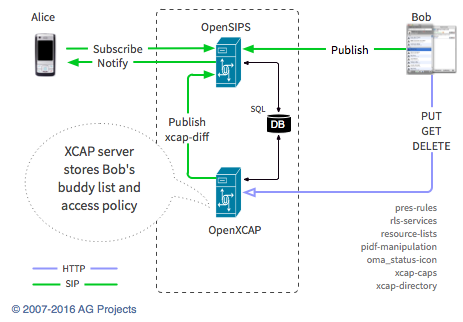 An XCAP server is used by XCAP clients to store data like buddy lists and presence policy in combination with a SIP Presence server that supports PUBLISH, SUBSCRIBE and NOTIFY methods to provide a complete SIP SIMPLE server solution.